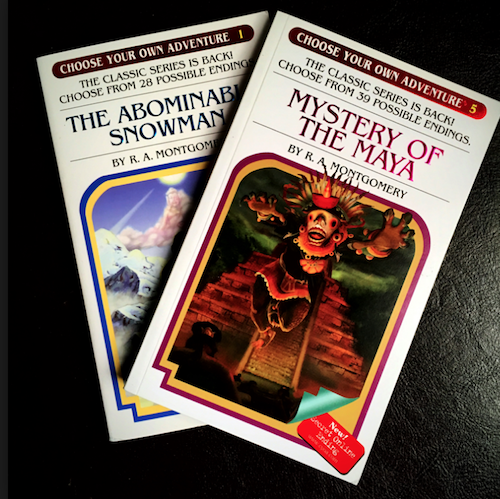 When I was a kid, my mom had to confiscate my Choose Your Own Adventure books. For an already high-strung kid prone to anxiety, these books were not a good choice, pushing me past the limit of what my 7-year-old psyche could handle. I would use a complex system of folded pages and paperclips to try to mark off the plot twists that would ultimately get me the best ending; even worse, I became paralyzed by simple decision-making because I would try to imagine what events could cascade down from me choosing rainbow sherbet over cookies and cream at Baskin Robbins. Somehow, this snapped me out of my existential crisis (although reading it now, I feel like it maybe could just as easily have gone the other way, where I just stayed up at night imagining random horrible ways to die). At any rate, I remembered my old book-based neuroses the other night when Ruby had to do an assignment for English class in which she wrote about one historical event she could change if she could and why. She gets it. She gets the good and the bad and the way they intertwine. So far, it hasn’t caused her to go into a tailspin and be unable to order an ice cream cone. If that happens, though, I know just the story to tell her to get her through it.